There’s something special about having your own garden. It’s like creating your own escape place where you can go whenever you’re in a need of some meditation. How can you better be at one with yourself if not by being at one with nature? It’s the best stress-relief you can have, surrounded by vastness of green. You know it’s recommended to spend time outdoors and visit areas with predominant greenery like parks and forests, so a garden is your chance to bring all the greenery close to you. Taking care of plants can spark up compassion because you supervise their growth, water, feed and protect them, and in turn, you also get rid of anxiety, you feel pleased and refreshed. With certain aspects taken into consideration, such as the fertilisation, pest and weed control, there are two types of gardening: organic and conventional. This has an impact with the outcome as well as with the soil, and can influence the choices you make regarding gardening supplies. You have to weigh in both the pros and cons to be able to make a better decision. As you might guess, organic gardening involves using strictly natural methods, leaving no room for chemicals when looking after the plants. 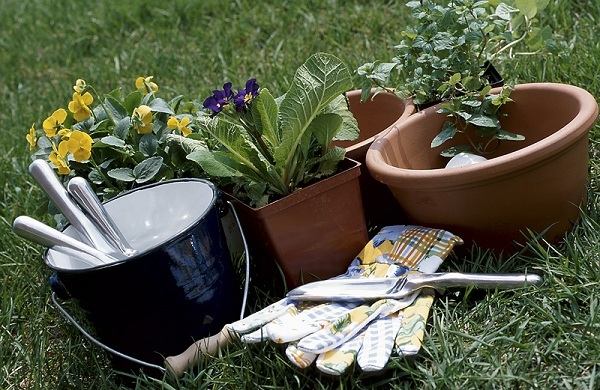 Searching through the variety of gardening supplies, you’ll be able to find organic fertilisers made from minerals, animal or plant waste, in the likes of compost and manure. This kind of fertilisers help the soil by releasing all the nutrients and help with the soil’s ability to retain water. Having in mind they don’t have chemicals, they ensure the growth of plants without harming them, and even if you think you’ve added too much of them, they are slow-release, so it’s all going nature’s way and there’s no reason to worry about harming your plants. They’re as eco-friendly as they can be. Provide enough moisture and warmth, and the microorganisms will do the work. Instead of the common pest and weed control options that are full of chemicals, you can opt for birds to take care of pests and organic mulch in order to prevent weed sprouting. Conventional gardening consists of implementing methods that aren’t natural, but are synthetic and artificial. Unlike with organic fertilisers, nutrients are refined so they are instantly available for plants. However, if you overdo fertilisation, you can kill the plants and disturb the ecosystem. Another reason people opt for chemical products is because they are inexpensive. As convenient as it might sound, there’s the danger of chemicals spreading to your plants. While organic fertilisers don’t affect the soil, chemical ones can change it’s pH levels which can result in more pest outbreak. Chemical pesticides can rid you off pests immediately, but doesn’t it make you wonder what they can do to the plants as well? You won’t even see when toxins make their way into your food. It’s important to think long-term and consider how your choices affect the soil. Since gardening doesn’t only refer to flowers, you’ll also be growing your own produce and the seeds you purchase matter a great deal. For best results, you can’t go wrong with organic heirloom seeds. You decide what makes it on your menu, so why not go for something completely natural that’s also delicious?